Show someone you're thinking of them with our Pride of the Smokehouse. 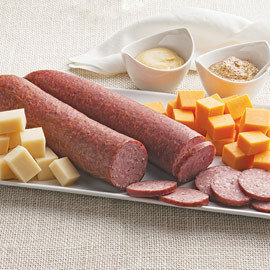 This savory selection features some of the best sellers from our smokehouse. Sure to be a crowd pleaser, this pack is great for any occasion. Greatly appreciated holiday gift. Shipped overnight, well packaged and fully enjoyed. These were enjoy very much by the people that received them. Ordered Pride of the Smokehouse and very pleased with products. The smoked cheese is especially good. Definitely will order again with Amana. Highly recommended. Very pleased with the delivery time. 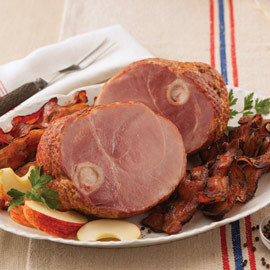 We have ordered Amana Meat Market products for a number of years and are always pleased with the quality and value. Our out-of-state children and their families enjoy receiving a taste of Iowa. However, I am disappointed that you don't honor the requested shipping dates that area part of your order process. Why bother to include this feature if it isn't honored? This and last year our out-of-state children received their shipments earlier than the date they should have had they been shipped on the requested dates. While you should be given kudos for promptness there may be cases where we know when the recipients will or won't be home to receive perishable packages. In the future, we may order when we know the ship dates don't matter and you won't have the visibility of earlier ordering. Amana Response: Thank you for your comments, Bill. With all the delays UPS was warning us about the last week before Christmas, we erred on the side of caution and sent a bit early vs. having it show up to late. We do try to get as close to the preferred ship date as possible, but with Christmas deliveries it is always so tough with the volume we and UPS ship out. If you ever have a specific date that your recipients cannot receive before, please indicate this in our Special Instructions box during checkout and we'll do our best to get it there when you request. Thank you so much for your business! We ordered this to send to family out of state. Product arrived quickly as promised. I sent this as a gift and they loved it!! They have lots of great Iowa options for gift giving and are so helpful. Definitely on my short list for holiday and business gifts. I highly recommend using this establishment. Very fast and fine service. Fast service! Great products will order again! Thank you! We ordered one of your bundle deals and ordered some ride alongs with the order. That is the only way to go. Great stuff. Cheese curds are out of this world. Love the bacon, ham, sausage. Love it all. Well-packaged. Arrived quickly and efficiently. Ham,bacon sausage,cheese were excellent. Outstanding quality. Guests were very impressed. My nephew enjoyed the gift, but was concern because all dry Ice was gone. Meats were still cool but not cold. I was surprised with this type of issue. Amana Response: Thanks for the note - the condition of your gift actually sounds perfect. 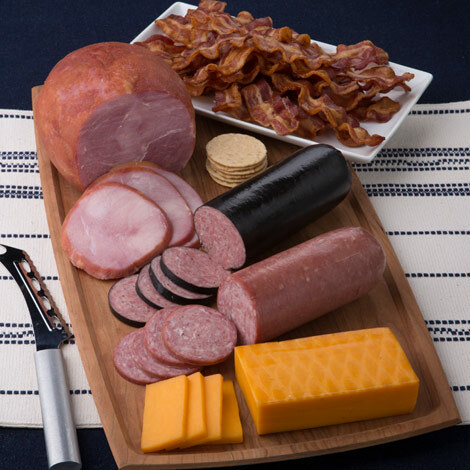 Our smoked meats travel great and are not frozen. In the summertime, we often put dry ice in due to the heat, but it is not necessary for the safety of the meat. We want the dry ice to be completely gone when it arrives as we don't want your recipient to have to deal with a hazardous material. Arriving cool is exactly what we would expect. If you ever have a question upon arrival, please give us a call. Delivered to our friends as promised. Our family loved the selection. Great to share with friends during party season. Bought as an Easter Gift...recipient was thrilled and loved the quality of your products. Great fast service High quality Gave as gift and they loved it! Got delivered on time and they loved the meat! Have ordered Amanda hams and gifts maybe 6 times now. Great quality and taste have been consistent. Will continue to order for special occasions as well as gifts. This was a Birthday Gift for my Father who turns 93 on Feb 13th. He still lives at home and enjoys Ham, Sausage and Cheese snacks on Cracker. This gift was a gig hit....Many Thanks! It has all the meats I love & really taste great. I can do without the cheese since I've been forbidden to eat it. I'm making the ham for Thanksgiving & have eaten the sausage. Great meats.